Published November 8, 2017 By Anna T. This post may contain affiliate links. Regardless, I only recommend sites I've researched and/or used and trust. CACTUS Global is a company based in India, specializing in English language scientific, academic, and medical writing. They work with a large number of multinational pharmaceutical companies and medical research organizations. 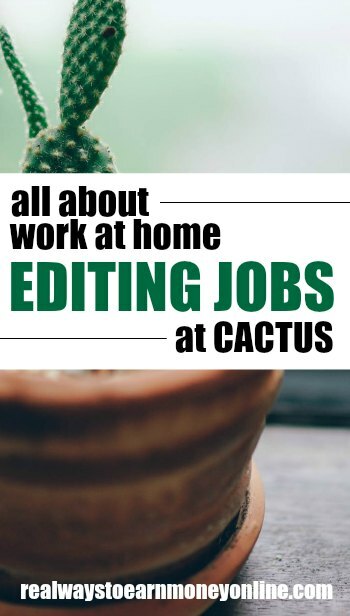 CACTUS prefers home-based employees for certain positions, particularly content editors. The company has a video posted on their website (scroll about halfway down the page) and crossposted on Youtube with people describing in very plain terms the experience of working for the company as a home-based editor. In these videos, it sounds like a very flexible job where you’ll be assigned certain documents to edit by the company, and spend your days making corrections. Most of the company’s writing staff aren’t native English speakers, and the editors are expected to watch for the kinds of language errors and typos that frequently occur when someone is writing in a second-language. Also, since the company specializes in scientific documents, the editing process is likely to be quite technical. You can probably expect to spend a good amount of time fact checking, looking for notation problems, and fixing errors in terminology. The company does not provide salary information on their website, and during my research around the Internet I found contradictory information. Some sources claim that editorial jobs pay about $15.00 an hour. Others insist (without any reservations) that the job pays very poorly—much less than the standard US minimum wage. It’s hard to say for sure which number is accurate, and it’s possible that the rate has changed over time. Related: FREE 45-minute online workshop explaining how to go about starting your own freelance general proofreading side hustle from home. On the company’s website, scheduling is described as “flexible,” but there is no mention of a specific hourly requirement. From what I could gather, it sounds like you can choose whatever hours you like, but you’ll have to produce a certain minimum level of output. Some workers claim that there are plenty of documents available to edit. Others insist that work is difficult to find and scarce. The actual amount will likely depend on the particular job you’re hired for, and the time of day may also have a big impact on the number of documents available. To become an editor for CACTUS, you will need to have excellent written English skills with a good eye for small details, and you’ll need to be familiar with Microsoft Word, Excel, and Powerpoint. There are also specific educational requirements that vary depending on the position. Most jobs at CACTUS are subdivided into different academic fields, such as medicine, or engineering. They expect all editors and writers to have a college level educational background that directly relates to the position they’re applying for. Additionally, while CACTUS has on occasion hired workers from all around the world, many of their jobs, including many work-from-home positions, require you to live in India. This may change depending on their needs at any given time, so you should check the website periodically for the availability of positions in your country. The job requires a computer that can run the software programs mentioned above—all of which have fairly low system requirements. As long as you can meet that basic minimum, there’s no special gear to buy. To apply, you fill out a form on their site, and take a short test. If you pass, they will send you more tests and conduct a series of interviews. You can find a fairly large number of worker reviews for CACTUS Global on Glassdoor.com. Generally, opinions on the company are extremely mixed, and I found quite a few negative comments. The main theme among those who complained was disappointment over the pay rate. Most insisted that they barely made minimum wage. Others claimed they didn’t even make that much. To make matters worse, the job is supposedly very difficult. You’ll spend a lot of time wrestling with documents that are tough to read because of complex language or poor phrasing, and after all that hard work you may come away feeling like you’re getting a lot less money than you deserve. Another common cause of complaint was a dissatisfaction regarding the oversight process. Editors are apparently given a grade for their performance on each document they complete, and low grades can severely impact your earning potential. This is seemingly made worse by the fact that the rules are poorly explained during the training process, and not always applied consistently. Furthermore, if you disagree with your reviewer, there isn’t a reliable way to appeal to a higher authority. You’re basically just stuck with it. According to some workers, the primary cause for the oversight problem is that reviewers (those who give out the grades) are generally not native English speakers, nor are they particularly knowledgeable on the subject matter of the documents they’re grading. This results in situations where reviewers incorrectly think awkward sentence structures are actually correct, or get their facts wrong on the substance of a particular article and give out bad scores without justification. There were also conflicting reports about the amount of work available at a given time. Some former employees said it was hard for US workers to achieve the minimum required workload unless they kept strange sleeping hours to make sure they were online when the work came in. Others didn’t mention this problem, so your mileage may vary. On the positive side, most people enjoyed the flexible work schedule, and many workers thought the documents they edited made for interesting educational reading. So as far as work from home jobs go this may not be too boring, at least not for those with an interest in science and other technical subjects. If this job sounds like a fit for your skills, and if you’re willing to work through some of the issues mentioned above, go here, and click the “work from home” tab at the top of the page to see if they have any openings available in your area. We've also published an extensive list of over 20 work at home editing and proofreading companies if you're interested in other opportunities. I have been freelancing for Cactus for three years. (In fact, I first heard about them on this website, so thank you!!) I think part of the reason for the wide inconsistency in people’s reviews is that the experience depends a lot on the subject area(s) you apply for (and qualify for). I edit papers in math and computer science, and there is always plenty of work available. I typically work around three days a week (by my choice), but there doesn’t seem to be a minimum number of hours required, as long as you keep them informed about the times you are available. Pay is per word, not per hour, and I believe it depends on the subject area and also on how you do on the qualification tests. (I was surprised how challenging they were! I was rejected for another subject area I applied for.) So again, different people’s experience will vary a lot. Initially, my effective per-hour rate was pretty dismal, but as I have learned a few shortcuts and become much more fluent with Microsoft Word, my average per-hour rate has almost doubled and continues to increase. (I also have a bad habit of spending way more time than necessary on some papers just because I find them so interesting!) The bonus system for doing good work and meeting all deadlines is simple and clear and seems appropriate to me. I have found their communications to be courteous and helpful, and I feel genuinely respected. Payment is consistent and hassle-free. I really enjoy the work and love getting to learn new things about obscure niches in the field. I also like the fact that the work feels worthwhile; I feel good that I am helping researchers whose native language is not English have a better chance to publish their work and be recognized for it. I guess the biggest negative would be that the pay could be higher, though I’m not sure I could find significantly higher pay for roughly the same work and the same flexibility. It’s also pretty isolated work; there isn’t really any interaction with the other freelancers, so you can feel you’re working in a vacuum sometimes. Freelancers who work for Cactus in the other subject areas might have different stories to tell, but my experience has been positive overall. I would recommend it for anyone with strong English skills and an academic bent, plus the usual working-from-home qualities of being self-driven and having good time management skills. Having nice long chunks of time for uninterrupted focus helps too. Thanks again to realwaystoearnmoneyonline for introducing me to Cactus! I hope this info might be useful for someone else who is looking. Thank you for your thorough and thoughtful review! I know your info will be helpful to others who are considering this company. Hi Shirley, I recently applied for Cactus and I went through series of test but failed my final test, is there any advise you can give me when I reapply in two months? . Hi, Sedinam. For the Cactus qualification tests, be sure to give yourself plenty of time. When you encounter any matter at all that you are unsure of (spelling, grammar, punctuation, word meaning, etc. ), search online to learn the correct form(s). Sometimes there can be more than one correct form; in these cases, choose a form that seems appropriate (or follow the one used predominantly by the author) and be sure to apply it consistently throughout the document. In the meantime, I would strongly recommend using the waiting period to sharpen your English skills. For example, sign up with Textbroker. They accept writers of various skill levels, and they give individualized feedback to help their writers improve. By studying and applying their feedback, you can bring your skills up to a level that will qualify you for more lucrative writing and editing work. Plus, you’ll be getting paid for writing while you learn! Do you remember how many tests you had to complete overall? I have done the inital online test (mostly multiple choice stuff) and just completed an actual editing test edit (which was approximately 1 page long). I kind of hoped that this would be it, but it sounds like there are more tests to come! And you know I’m sharing this on social media as well! Thanks for sharing. Have a great day and rest of the week. And happy Thanksgiving! Thanks as always, Cori! Happy Thanksgiving to you, too!